Washington defends Israel, blames Hamas for escalation | The Times of Israel. The paper: NY Times. The dateline: Tel Aviv. The byline? Ethan Bronner — who looks at the Hamas weapons stockpile. I’m disappointed his lede starts out saying the conflict began when Israel assassinated Ahmad Jabari. Was the rocket fire leading up to it just chopped liver to Bronner? via Live Blogging Israel’s Media War 11/18/2012 | HonestReporting. And there is no media bias in the mainstream media against Israel? Or have the standards of journalism at the Gray Lady sunk so low that the facts no longer matter? I’d say it’s a tossup. 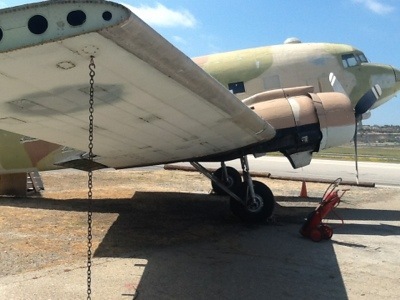 An ex-Israeli Defense Forces C-47 sits awaiting restoration in front of the Commemorative Air Force hangar at Camarillo Airport, California.